May 11-13 and May 29, 1998. 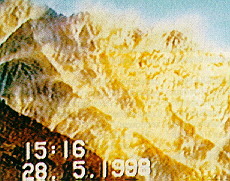 Photo of "Glowing Mountain" Following Underground Nuclear Tests in Pakistan, 28 May 1998. The above photograph is a clip German television. It shows a mountain on the India-Pakistan border which is anomalously glowing following a series of nearby underground nuclear bomb tests. No additional information is available at this time. Special thanks to Dr. Franz Lutz of IRT in Germany for providing the photo. More information on the underground nuclear tests is given below, taken from an earlier OBRL-News posting. NOTE: See the "Postscript September 2002" below, for a graph of meteorological data on India's monsoon rains since 1988, providing supporting evidence for the discussion given here. Over 50 years ago, Wilhelm Reich observed unusual long-distance effects from above-ground nuclear tests. Dr. Reich's observations were based upon his discovery of a unique life-energetic force in the atmosphere (the orgone energy) which underlay nuclear, meteorological and biological phenomenon , much in the manner of the older physical concept of "aether" and "vital force" combined, but also with meteorolgical properties. With a nuclear bomb test, the orgone energy became highly agitated and irritated, much in the manner of irritated protoplasm, but on a much larger planetary scale -- literally, his ideas suggest the concept of the "living earth" is more than metaphor, and that the Earth's life-energy field could be highly disturbed. Reich called this disturbed/iritated phenomenon the "Oranur Effect". In more recent years, observations on Oranur were corroborated by followers of Reich's approach (Jerome Eden, Richard Blasband, James DeMeo, Stephen Nagy) as also occurring after underground nuclear tests, and following nuclear power plant accidents. The nuclear tests or accidents create a tremendous Oranur disturbance in the energetic substrate which permeates the earth, atmosphere, and living creature; observed effects included heat waves, increased high pressure, and social/human reactions often expressed as riots or social disturbances which burst forth on the social scene in a disproportionate manner -- the human emotive-thinking process appears affected, just as is the atmospheric pressure and clouds. 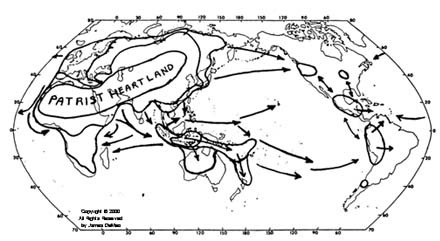 A patterned "downwind" hemispherical response was discovered, wherein nuclear bomb tests or accidents in Asia would be followed by heat waves in the USA within about two to three weeks. In some cases, the transition of anomalous stagnant air masses moving across the Pacific Ocean could be followed on satellite images (as an expanding cloud-free area) after the Asian bomb tests. Nuclear tests in Nevada, USA produced more immediate local results. Other scientists who had no knowledge of Reich's earlier observations, such as Gary Whiteford, Yoshio Kato and Mitzuru Katagiri, independently observed similar anomalous long-distance effects following underground nuclear tests and/or nuclear power plant accidents. These effects included anomalous changes in global earthquake patterns, changes in upper atmospheric temperature, and anomalous perturbances in the Earth's polar motion. All of the above individuals, with one exception, hold advanced degrees in physical or social/health sciences, and many were employed at universities. They have presented their observations in papers to various scholarly scientific societies, published in a few non-mainstream science journals, but they have been mostly ignored by the power-brokers of modern Big Science. Contemporary physics denies the possibility of such long-distance effects, as it continues to rely upon disproven and outdated assumptions of "empty space", with dismissive ignoring of data on the existence of life-energetic phenomena (such as the human energy field) or related concepts in geophysics (such as the Earth's energy field, which is similar in some respects to geomagnetism). Most environmental groups, having fought for years to gain a foothold in the halls of academic and political power, likewise refuse to consider the reality of these long-distance anomalous effects from nuclear bomb tests and power plant accidents. Nevertheless, the effects appear real, and sufficiently documented to satisfy all but the most intractable critic that there is something going on that deserves a public airing of the issue, and further investigation. (Full citations on all the above mentioned individuals and effects, with pertinent article reprints, can be found in the publication "Unusual, Long-Distance Atmospheric and Geophysical Effects from Underground Nuclear Bomb Tests and Nuclear Power Plant Accidents", available for $7 postpaid from Natural Energy Works, PO Box 1148, Ashland, Oregon 97520 USA). Here is a chronology of recent events following the unprecedented testing of ten nuclear bombs by India and Pakistan all within a few days time, and in the same geographical region, with a spreading eastward of the disturbance over ensuing weeks. 11-13 May: India tests five (5) nuclear bomb tests underground at its test site near the Pakistan border. The explosions measured up to 5.6 Magnitude on the world's seismological network. Yields were said to be around 10 KT. 22 May: Killer heat wave hits India and Pakistan, with temperatures up to 120 F, and 34 dead as of this date. "the lingering early-season heat wave is unusually severe". The heat wave occurred so quickly after the nuclear tests, and ordinary citizens in the region were asking questions about the relationship between the two events so frequently, such that the Indian Meteorological officials made a public statement denying any relationship. 28 May: Pakistan tests five (5) nuclear bomb tests underground at its test site near the Indian border. The explosions measured up to 4.6 Magnitude. 29 May: "366 Dead in India Heat Wave" Temperatures up to 122 F. "Most devastating heat wave in years"
30 May: Killer earthquake in Afghanistan. 2,500 dead, 6.9 Magnitude. 1 June: Another 100 dead in India Heat Wave. 5 June: Heat wave in India/Pakistan death toll up to 1,359 persons. 5 June: Swarms of tornadoes across the USA. Spencer, South Dakota is wiped off the map. Also in Michigan, Tennessee, Pensylvania and New York -- regions where tornadoes are highly unusual. 12 June: Heat wave in India/Pakistan death toll now at 2,500 persons. 12-19 June: China reports flooding, 100,000 persons evacuated, 40 deaths. 3 July: Wildfires across Florida. Tens of thousands evacuated. Heat wave and smokes from Mexico to Texas to Florida. 3 July: Severe monsoon storms wreak havoc in Sri Lanka. 60 mph winds. Nature is pushing agains the blockage. 9 July: Subtle shift in tropical weather globally: Fires weaken in Florida, rains developing in drought areas of Africa, India, etc. 18 July: Heat wave now moving north, spreading into Midwest and West USA. In addition to the above, civil riots also errupted in parts of India and Indonesia following the nuclear tests, and a wholely unanticipated border war errupted between Eritrea and Ethiopia (whose leaders are former allies). * Over 5,500 persons dead from earthquake, heat wave, and flood. * Approximately 200,000 persons forced to evacuate homes in China and Florida, to escape the effects of flooding and wildfire, respectively. * Financial costs are unknown, but surely must be over 1 Billion US dollars. * The final chapter has not yet been written: heat wave conditions which started after the nuclear tests may persist in the USA and elsewhere. It is difficult to say whether the spreading north of the oranur heat wave conditions into the Midwestern USA will be only temporary. It is possible the oranur effect which firstly irrupted in India/Pakistan attendant to the nuclear tests, which later spread regionally and eventually east across the Indian and Pacific Oceans into North America (primarily into Mexico and the southern USA states) is now moving again. If so, the East Coast should be affected soon, followed by Europe as it continues eastward. Citations to the above chronological events will be provided in a published version of this article, but are otherwise available from Earthweek, and via wire service reports in most major newspapers over the last several months. * UNUSUAL LONG-DISTANCE ATMOSPHERIC AND GEOPHYSICAL EFFECTS FROM UNDERGROUND NUCLEAR BOMB TESTS AND NUCLEAR POWER PLANT ACCIDENTS: Suppressed Scientific Evidence. Reprints of scholarly articles and reports from back issues of Pulse of the Planet journal, by Katagiri, Whiteford, Kato, DeMeo, Nagy and others, addressing this important issue. These incidents document the reality of what Reich called oranur as observed by eye-witnesses to nuclear accidents, as well as phenomena which can only be explained by the existence of a radiation-irritated atmospheric/planetary energy continuum. 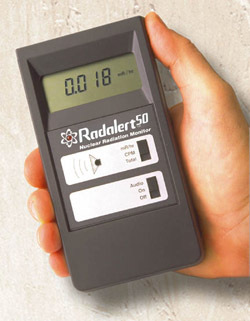 An essential tool for anyone concerned about nuclear issues. "Once a year the monsoon transforms the dry landscape [of the Thar desert] of dunes into a blossoming garden where cows and goats can graze and cereals thrive. But sometimes the rains do not come. 1998...was not a good year. In June, the hottest month of the year, the mercury climbed to more than 50 deg. C., a phenomenon the Sindhis attributed to the atomic bomb explosions in the desert of nearby Baluchistan." Drought has continued since May 1998 into December 2000 at least, creating a massive environmental and social crisis across the Rajasthan region. Crops have withered while grasses have been eated up by surviving wildlife and domesticated animals, whose numbers have in any case been decimated. Entire villages are migrating away from the region, their wells and streams having dried up. OBRL is currently undertaking a fundraising effort to organize a major cloudbusting expedition into the Rajasthan region, to see if we might help in this desperate crisis situation. (See the OBRL fundraising letter for details.) If you can assist, please contact Dr. James DeMeo of OBRL, using the contact information provided at the bottom of this page.
" SATTA RAM, 35, SIYONGION KI DHANI VILLAGE, BARMER: Forced to move out of his house, he shifted to a make-shift cattle camp 5 km away. Once he feeds the four cows that are still alive, he has to travel another 10 km in search of water. Twice a day, he sits on his camel and returns with 10 buckets of water on each trip. This keeps him, his mother, pregnant wife and four children alive. The stubble on his face shows he hasn't had a bath in weeks. " " SARPANCH UMED SINGH, 51, ARABA VILLAGE, BARMER: Farmers from his village have been forced to become daily-wage earners and they reach the pond site at seven in the morning to eke out a living. Only 69 of the village's total population of 6,000 have been employed for relief work but have not been paid even after three weeks of gruelling work. Umed Singh is worried for he has heard reports of relief workers being paid only Rs 8 and Rs 10 instead of the Rs 60 fixed by the Government. " Farmers are reduced to daily-wage earners at relief camps. Cattle are left to die because there is no fodder. And the administration fears that water riots may break out. He doesn't know what tomorrow holds for him but today he has to deal with the business of life. And death. Till a few weeks ago, Satta Ram had 70 sheep, 50 goats and 10 cows. At last count -- it changes every day when the sun beats down relentlessly on the desert sands -- 60 of the 70 sheep were dead and only 20 goats still alive. Six cattle carcasses had been tied to a tractor and dragged away. Till last year, he was the proud owner of 25 bighas of land that sprouted bajra and mustard. This year, the only thing that has grown is despair. The food storage containers are empty and for the first time in his 35 years, Satta Ram has had to go out to buy bajra. There is no land to till, no milk to sell and no ghee to process. Life is as harsh and brittle as his piece of land, hope as dry as the village well. For people in Rajasthan, the sun rises as a grim reminder of the devastating drought and sets only after it has added to the toll. Yesterday, Satta Ram mourned the death of his cows. Today, Pura Ram has bid farewell to yet another sheep. Once, he was the proud owner of 100. Yesterday, only 30 were alive and today eight more have gone. Yesterday, he was still putting up a battle to survive. Today, his shoulders have drooped. Each of the affected villages has a story to tell but in this state, misery is measured through statistics, not human suffering. That Tonk and Ajmer have come close to resembling the deserts in Barmer and Jaisalmer seems to be of little consequence to the administration. It is difficult to find officials out in the villages where the sun burns the skin. The women have no choice but to scrounge for water. Where, if some of them are lucky, they can wash a few clothes and use the same water to have a bath. Udaipur, a city dotted with lakes, is facing a drought of this intensity for the first time. At places, the situation is so pathetic that man and beast drink from the same pond. The city administration fears that very soon water riots may break out in Udaipur. In other parts of the state, people are shifting to areas where food and water are still available, although at a price. Some like Saga Ram of Dhava village in Jodhpur district are merely shifting their business. Saga Ram used to sell earthen pitchers in the village. But who would buy pitchers if there is no water to fill them with? Also, most of the villagers have already migrated from Dhava, leaving behind a ghost village. So Saga Ram is taking his wares to sell in neighbouring states. For the state, where hope is as scarce as the rain, the drought has exacted a great personal cost. Baisran Ram, a middle-level farmer quite content with 50 bighas of land and 50 cows, has now been reduced to working in a cattle camp for a measly Rs 1,500 per month while his wife Gauri struggles as a daily-wage earner. His brother has been forced to move to Haryana with the 50 cows. Their land, which produced enough bajra for all of them hasn't produced a single blade of grass for two consecutive years. Ram has now stopped going to the fields. That he is keeping 770 cows alive in this camp -- set up a month ago -- is the only solace that balms his pain. Most have had to do the same; swallow their pride since there is little else in the state where life has become a battle against a thirsty death. Where falling groundwater levels due to scanty rains has dried their fields and their wells. Where the kharif has failed for a third consecutive year and where in the vicious wheel of survival it's a cruel question of man or beast. So, hundreds of cattle are anointed and left to die. "I don't have enough water and food for my children," is Siya Ram's simple reply. In the fight for survival, abandoning all six cows was his only option and he has little time for guilt. Three successive dry years -- each worse than the other -- have hit his purchasing power. For someone who has never been to the market to shop for bajra, he now has to pay Rs 850 for a quintal. Once, his own field generated at least 60 quintals. Then again, once, he never had to pay for water. Now he has to spend Rs 600 to hire a tanker that will deliver water which he now has to store. Siya Ram will feel the pinch of this unforeseen expense for a long long time. For he has to pay a monthly interest of Rs 12 on every Rs 600 that he borrows to buy the water for his family. It's the same story for other families. Each more heart wrenching than the other. If one is lucky to have reached his cattle to a camp in time, it is only one hurdle crossed. There is food and water to think about. Life has become one long obstacle race as Thigga Ram soon realised. He thought he was lucky when he was hired as a daily wage earner. At least that would ensure him Rs 60 a day. So he got to the pond site at his village Kalodi in Barmer by 7 a.m. and dug till he thought he would collapse. But when it was time for his weekly payment, he was given only Rs 11 per day and there was little point in arguing, for in relief related work payments are measured on a scale. Thigga Ram was one of three labourers who would have got Rs 60 per day only if they dug the prescribed target of 12 ft by 12 ft. He insists they did but somewhere between the junior engineers, officials of the relief department and the panchayat samiti, his wages were cleared for only Rs 11. Where survival is measured on death's scale, it doesn't matter that his name is Thigga Ram. Luck seems to have forsaken Orissa. Six months ago it was the cyclone. Now the spectre of a drought looms large. Much of Orissa -- particularly the western districts of Kalahandi, Koraput and Bolangir -- is parched and there is no respite for its people. Take the inhabitants of Titlagarh in rocky Bolangir district. The mercury is 46 degrees Celsius and climbing, and there's no sign of rain clouds. Taps, tanks and wells -- everything is bone-dry and Titlagarh has earned itself a new name Tatalagarh -- tatala meaning "sizzling hot" in Oriya. There is no escape for its people, like thousands of others in Orissa similarly trapped, even in coastal districts like Cuttack, Jagatsinghpura and Kendrapara. At Berhampur, people buy locally made sachets of water for Rs 3. The Ret, Udanti and Sandol rivers have almost dried up. Despite being a littoral state, Orissa just does not have water. The ride to Bolangir town, the district headquarters, is a bumpy one through barren fields dotted with shrivelled trees, past gaunt villagers clutching pots and lining the horizon in search of water. "The only work is going out to find drinking water," explained Snehlata Behera, a villager in Loisingha block. At Sargad village in the interior of Bolangir, the only source of water is a pit of greenish water. "We use it for drinking, bathing and washing," says Gopobandhu Behera. The taps at air-conditioned hotels in Bolangir are hot and dry. "Politicians are more to blame than nature," says Balgopal Mishra, the MLA from Bolangir. An accusation echoing through the state. The crisis has made the state Government sit up. But perhaps Orissa depends only on natural deliverance -- the monsoons in June. Postscript, December 2000: Unfortunately, the Monsoon Rains of June-July 2000 were minimal in the affected regions of Rajasthan and Orissa. The crisis continues to worsen. OBRL is currently undertaking a fundraising effort to organize a major cloudbusting expedition into the Rajasthan region, to see if we might help in this desperate crisis situation. (See the OBRL fundraising letter for details.) If you can assist, please contact Dr. James DeMeo of OBRL, using the contact information provided at the bottom of this page. Postscript September 2002: Below is a graph of India's monsoon rains from 1988 through 2002, showing that the monsoons have oscillated between 90% to 110% of normal for most of the period. The two deviations from this patter are firstly in 1988 when rains were 120% above normals, and secondly in 2002, when the monsoon rains have largely failed, falling to around 70% of normals. Rainfalls from 1994 through 1998 were above normal, while since 1999 they have been below normal, with a dramatic deviation away from the predicted forecast in 2002. 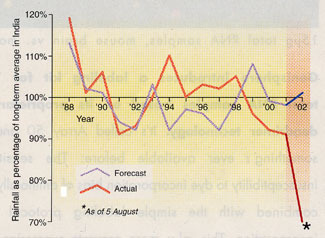 This suggests a possible connection of the current drought episode back to the dramatic nuclear bomb tests and atmospheric oranur reaction of summer 1998.
from Science, 23 Aug. 2002, p.1265. Of particular consideration is the fact that for many years India and Pakistan have been facing off against each other militarily, along various cease-fire lines between their nations and along the Kashmir border. This situation escallated to a particularly dangerous intensity in early 2002 following the terror-bombing of the Indian Parliament by Islamic fanatics, and it seemed possible that a nuclear war might break out between the two nations. Under such circumstances, we anticipate that nuclear warheads might have been moved into forward positions, with their triggers inserted in preparation for their use -- these activities may have been sufficient to "re-kindle" the oranur reactions in the local atmosphere, leading to the expansion of the local desert atmosphere. While much of this remains in the realm of hypothesis and speculation, it is based upon many decades of similar observations, that nuclear bomb tests do factually create oranur reactions, and consequent atmospheric effects in the direction of heat-wave and drought. 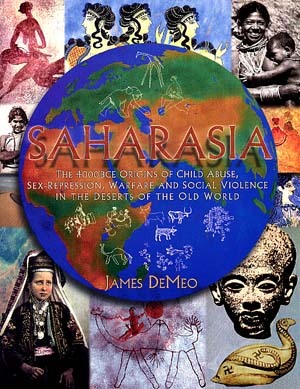 * Click here to review and/or purchase books by James DeMeo. * The Orgone Biophysical Research Lab: James DeMeo's Research Website. * The Saharasia web page. make a donation to the OBRL research fund. Orgone Biophysical Research Laboratory, Inc.
by the Orgone Biophysical Research Laboratory, Inc.